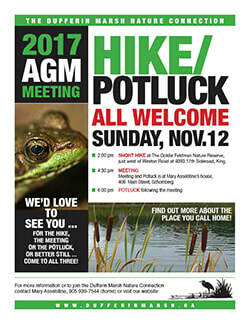 Join us for a hike, meeting and potluck dinner to celebrate the past year for the DMNC and to plan for the future. Spend a relaxing time with great people and great food. The hike will start at the Happy Valley Nature Conservancy. Park at the bottom of the hill on the 7th sideroad, King (not the parking lot at the top). A meeting and potluck dinner will follow. Stay tuned for the 2017 activity report. Come for the hike, the dinner, or the meeting or all three activities! Meet at the learning shelter in the Dufferin Marsh (on the south side of Dr. Kay Drive in Schomberg). 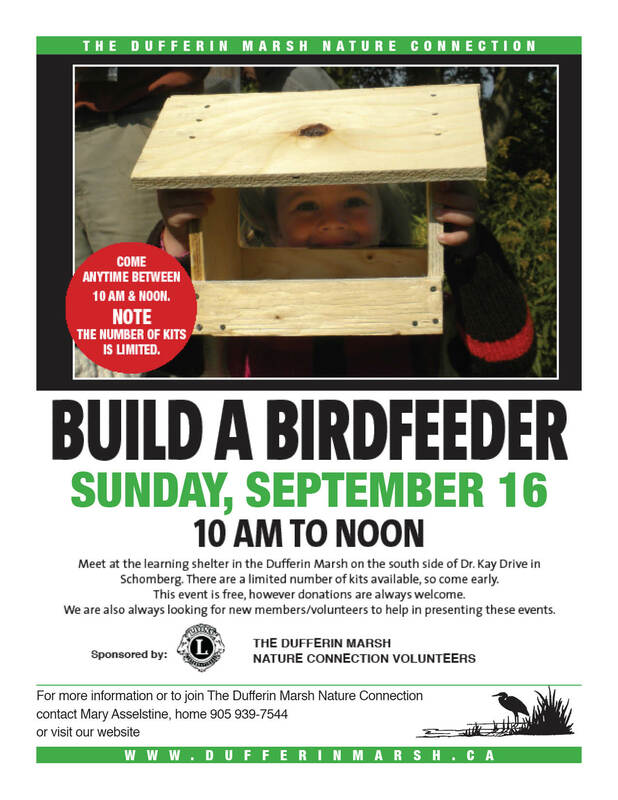 We've teamed up with the Schomberg Lions to bring your kids the opportunity to make a birdfeeder for themselves. Suitable for small birds (and small children), the birdfeeders are free of charge. There will be refreshments available. There are a limited number of kits available, so come early. Meet at the bulletin board on Dr. Kay Drive just east of Main Street. 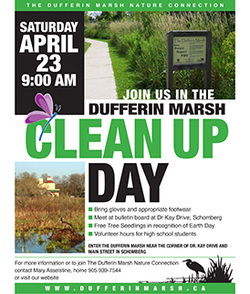 Join members and friends of the Dufferin Marsh Nature Connection as we cleanup the Marsh area along Dr. Kay and Cooper Drives (and possibly beyond). Vinyl gloves and plastic bags will be provided. We recommend you bring work gloves and wear rubber boots. Grackle Coffee, and Timbits will be provided. A special thanks to our longtime supporters the Grackle Coffee Company (208 Main Street, Schomberg) for donating tasty Coffee for the volunteers! Remember students, this activity is good for high school Community Service Credits so bring your forms! 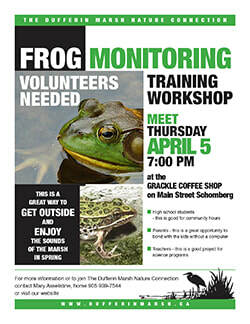 Now in its 14th year of operation, the Dufferin Marsh Frog Watch will be getting underway with training in early April. Monitoring begins in mid April when the frogs first start to sing and lasts until the end of May (depending on the weather). This is great way for high school kids to accumulate community hours. It is also a great way to bond with younger children by accompanying them on the monitoring which is scheduled for early evening twice a week. If you're interested in coming out, we'll be holding a training and information session at the Grackle Coffee Company (on Main St Schomberg) on Thursday April 5th, at 7:00 pm. 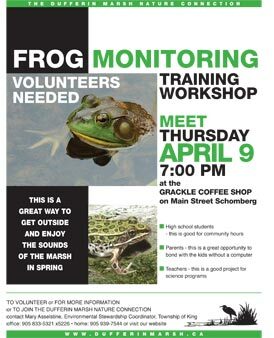 The Frog Watch programme provides important information to us as we continue to monitor the overall health of the Marsh and involves students from the Schomberg Public School in the life of the Marsh. Students collect data during their excursions to the Marsh, and this information is used in a number of classroom situations, including biology, math and health. The audio for the FrogWatch training (audio files to help you learn the various frog calls) are ﻿available in a zip file format here﻿. Download them (they are in the standard MP3 format), and load them onto the audio player (iPod, iPhone, iThingie etc.) of your choice. Starting as a symbolic lights out event in Sydney in 2007, Earth Hour is now the world's largest grassroots movement for the environment, inspiring millions of people to take action for our planet and nature. Participating is a simple way to show that you want to protect the planet and sends a powerful message that together we can make a difference. 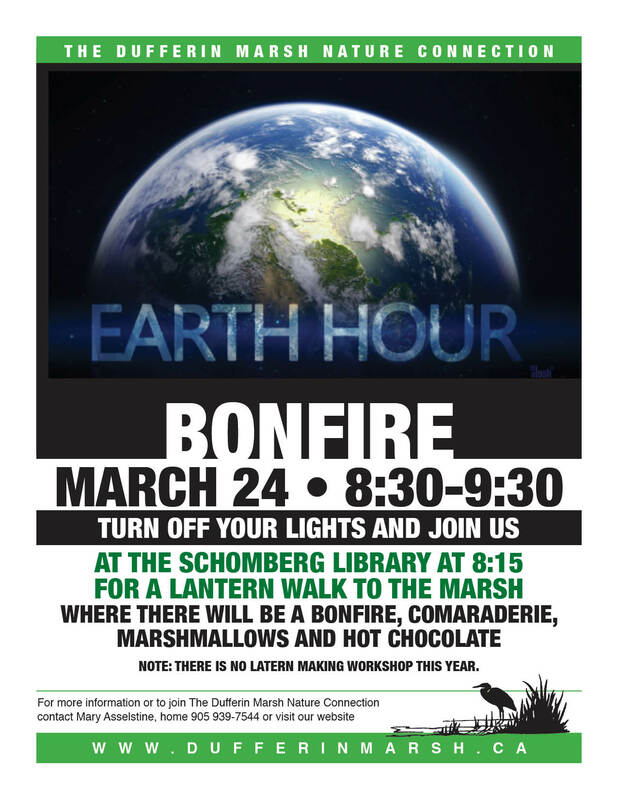 Meet at the Schomberg Public Library on Main Street in Schomberg with your lanterns and we will walk to the marsh for a bonfire. Or just TURN OFF YOUR LIGHTS and join us in the Marsh as we gather around a bonfire with telescopes, hot chocolate and marshmallows... Don't forget to turn off your lights before you leave home! 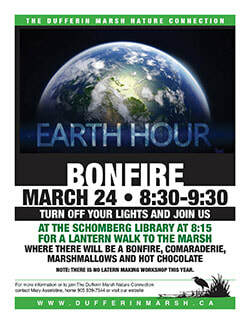 Please click here to learn more about Earth Hour or sign-up for the event. Join us for our 14th Annual Community Skate and Bonfire at the Marsh. Held on the second Saturday of February, it promises to be a wonderful afternoon in the "out of doors". Hotdogs and marshmallows will be available for roasting over the fire and coffee and hot chocolate will help warm us up! Our delicious coffee is provided by Grackle Coffee Company (208 Main Street, Schomberg). Dress warmly and bring your skates. Follow the trail in from the bulletin board on Dr. Kay Drive. As with all skating events in the Marsh, the event will be dependent on safe ice conditions. Check back here for ice updates in early February. 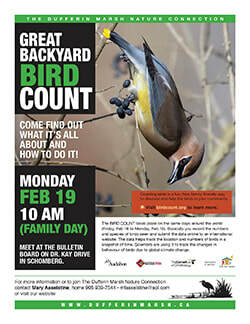 Celebrate Family Day by joining us on a citizen science adventure collecting data for the Great Backyard Bird Count. Dress for the weather and bring binoculars if you have them. Birdwatchers from more than 100 countries are expected to participate in the 19th annual Great Backyard Bird Count (GBBC), February 16–19, 2018. Around the globe, tens of thousands of volunteers – of all ages and birding skill levels – will count birds in backyards, local parks, nature reserves, and wherever they happen to be. 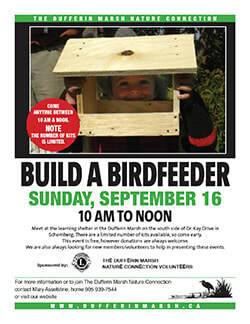 This free, family-friendly educational activity is loads of fun and supports bird conservation! Click here to see what birds have been spotted on our previous outings. The GBBC provides a great opportunity to learn more about birds and connect with nature, and is an ideal way to learn from more experienced birders about the wonderful world of birding. The hike will start at the Goldie Feldman Reserve on the 17th Sdrd. west of Weston Road. A meeting and potluck dinner will follow. Click here for the 2017 activity report. 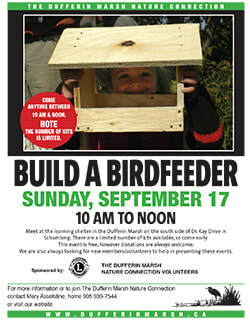 For more information, call contact Mary Asselstine at 905-939-7544 or visit the Dufferin Marsh website at www.dufferinmarsh.ca. Mmmmmmm…. Beer paired with Food Glorious Food!!! 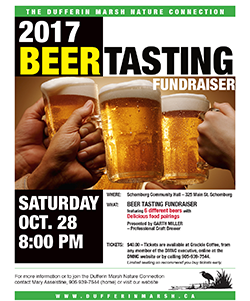 Join us for our second Beer Tasting Fundraiser, featuring a selection of craft beers from Ontario & Quebec ALE TO LAGER, BITTER TO RADLER. Presented by professional brewmaster Garth Miller. TICKETS: $40.00 - Tickets are available at Grackle Coffee, from any member of the DMNC executive, by calling 905-939-7544 or right here via Paypal. Dragonflies, Damselflies and Butterflies. Oh My! 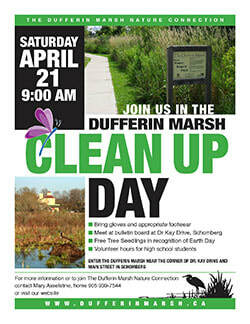 Meet at the learning shelter in the Dufferin Marsh off Dr. Kaye Drive in Schomberg. 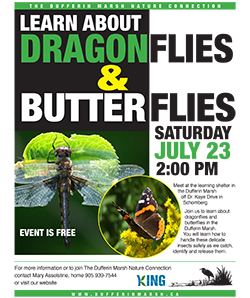 Come learn about Dragonflies, Damselflies and Butterflies. Participants will learn how to handle these delicate insects safely as we catch, identify and release them.This is fun for the whole family. 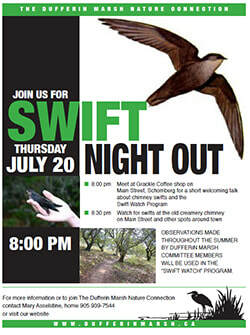 Did you know that we have a cool little bird that nests in chimneys in Schomberg called a Chimney Swift? This bird, that used to be common in southern Ontario, is now on the "Threatened" species list. Join us to watch these flying cigars with wings dive in and out of chimneys. The frogs are singing! The frogs are singing! 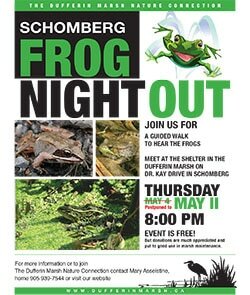 Join us on May 11 at 8 pm to learn about the frogs of the Marsh and learn to identify them by sound. Meet at the shelter on the south side of Dr. Kay Drive. A special thanks to our longtime supporters the Grackle Coffee Company (208 Main Street, Schomberg) for Coffee for the volunteers! 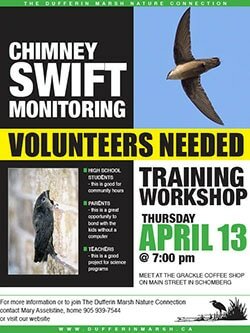 Did you know that we have a cool little bird that nests in chimneys in Schomberg called a Chimney Swift? This bird, that used to be common in southern Ontario, is now on the "Threatened" species list. 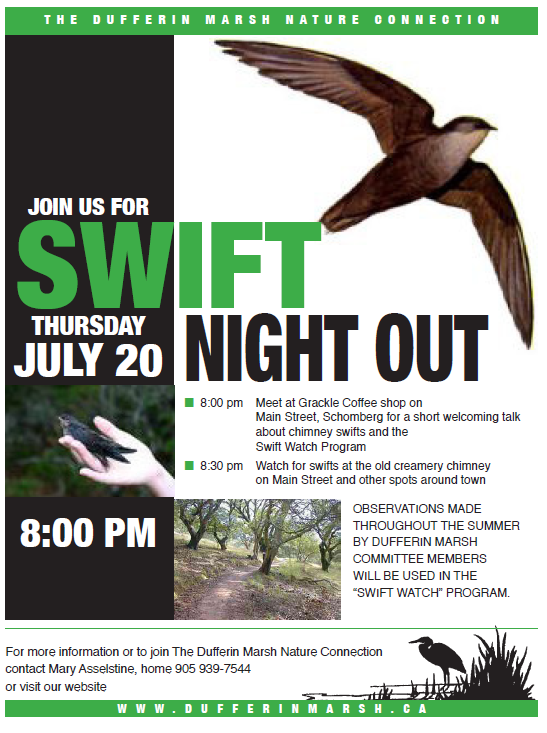 We are looking for volunteers to help us monitor these birds in Schomberg. Join us Thursday April 13 a t 7pm at Grackle Coffee on Main Street to learn about these birds and join our team of citizen scientists to monitor them. 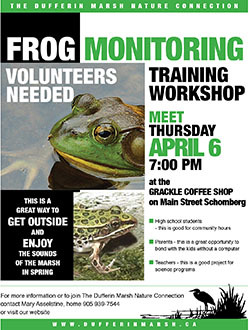 Now in its 13th year of operation, the Dufferin Marsh Frog Watch will be getting underway with training in early April. If you're interested in coming out, we'll be holding a training and information session at the Grackle Coffee Company (on Main St Schomberg) on Thursday April 6th, at 7:00 pm. “This Earth Hour, help shine a light on climate change. Changing climate change starts with us, here today. Together, we made history in December with the Paris global agreement to stop climate change. Now is our time to unite once again to create the future we know we can for our planet. This Earth Hour, WWF-Canada calls on people across the country to join others around the world to send a strong global message. The 11th annual Earth Hour takes place at 8:30 p.m. local time on Saturday, March 25, 2017. Six continents, over 170 countries, and 24 time zones will be united as a global community, making our voices heard through individual action. Meet at Emmanuel Presbyterian Church on Main Street in Schomberg and make a lantern... bring a glass jar you can decorate. Meet at Emmanuel Presbyterian Church on Main Street in Schomberg with your lanterns and we will walk to the marsh for a bonfire. Birdwatchers from more than 100 countries are expected to participate in the 18th annual Great Backyard Bird Count (GBBC), February 17-20, 2017. Around the globe, tens of thousands of volunteers – of all ages and birding skill levels – will count birds in backyards, local parks, nature reserves, and wherever they happen to be. This free, family-friendly educational activity is loads of fun and supports bird conservation! Join us for our 13th Annual Community Skate and Bonfire at the Marsh. Please join us for a hike at beautiful Cold Creek Conservation Area . Meet at the Education Centre. 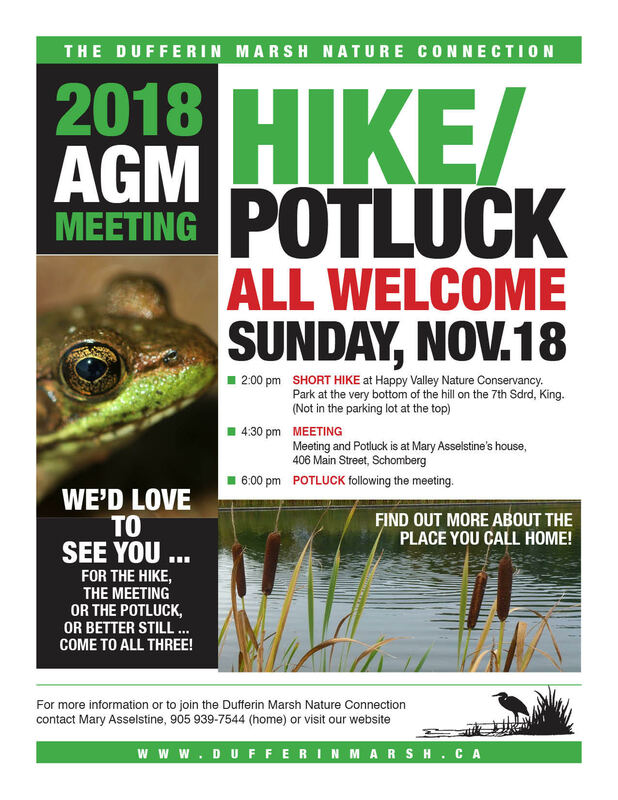 The hike will be followed by the Dufferin Marsh Annual Members Meeting (short) and a potluck dinner at 406 Main Street in Schomberg. Spend a relaxing time with great people and great food. 2:00pm SHORT HIKE at COLD CREEK CONSERVATION AREA located on the 11th concession King, between King Road and the 17th concession. Meet at the education centre . or better still ... COME TO ALL THREE! 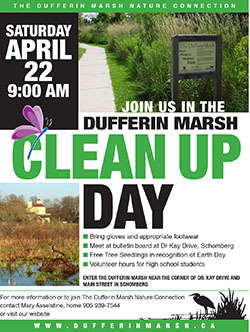 For more information or to join the Dufferin Marsh Nature Connection contact Mary Asselstine, 905 939-7544 (home). ﻿Agenda will be available closer to the meeting date. We usually meet every second Tuesday of the month at the Grackle (208 Main Street, Schomberg). All are welcome to attend. Please note that we do not meet in July, August or December. Meet at the shelter in the Dufferin Marsh (enter from Dr. Kay Drive just east of Main Street). 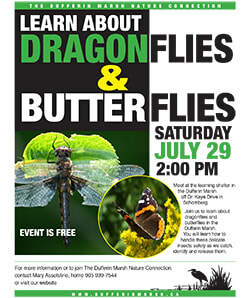 Come learn about Dragonflies, Damselflies and Butterflies. This is fun for the whole family. 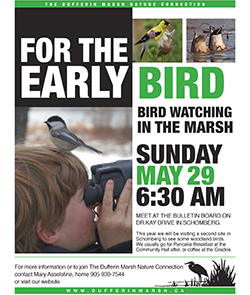 Bright and early (when the birds are most active) on the Sunday of the Schomberg Agricultural Fair weekend we will be conducting a bird/nature walk in the Dufferin Marsh. If you would like to join us, meet us at the pump house on Dr. Kay Drive. We'll go to the Lions Club Pancake Breakfast after the walk. Bring binoculars or your camera! The frogs are singing! The frogs are singing! 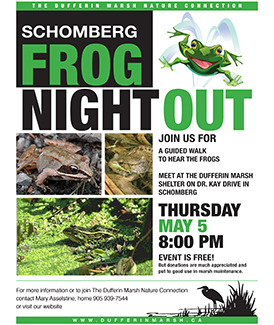 Join us on May 5 at 8 pm to learn about the frogs of the Marsh and learn to identify them by sound. Meet at the shelter on the south side of Dr. Kay Drive. 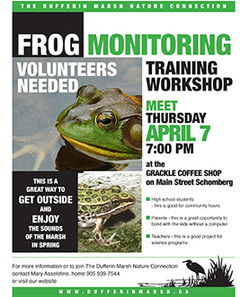 Now in its 12th year of operation, the Dufferin Marsh Frog Watch will be getting underway with training in early April. If you're interested in coming out, we'll be holding a training and information session at the Grackle Coffee Company (on Main St Schomberg) on Thursday April 7th, at 7:00 pm. Earth Hour is a symbolic event. Turning off our lights for an hour won't stop climate change but it does demonstrate that our individual action is important and adds up to make a big difference. More importantly, it sends a very powerful message to government and world leaders that people want policies and regulations put in place that can achieve meaningful emission reduction to help fight climate change. Everyone can participate in Earth Hour! And it's as simple as flicking off a switch - literally. You can participate by yourself or with family, friends and just a few candles. Or check out what's happening in your own community. 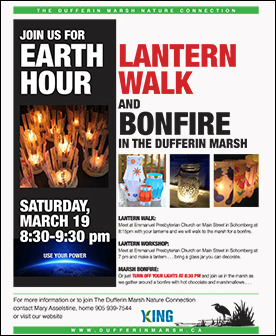 There are many cities, community groups, restaurants and bars that participate or host Earth Hour events. 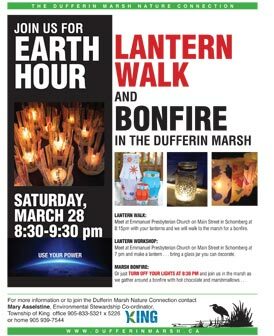 Meet at Emmanuel Presbyterian Church on Main Street in Schomberg at 8:15pm with your lanterns and we will walk to the marsh for a bonfire. Meet at Emmanuel Presbyterian Church on Main Street in Schomberg at 7 pm and make a lantern... bring a glass jar you can decorate. Or just TURN OFF YOUR LIGHTS AT 8:30 PM and join us in the Marsh as we gather around a bonfire with hot chocolate and marshmallows... Don't forget to turn off your lights before you leave home! Join us for our 12th annual community skate. 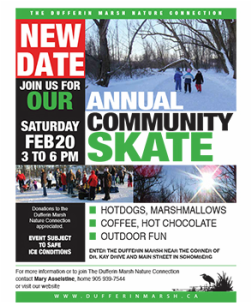 On Saturday February 20 the annual community skate will be held a the Dufferin Marsh (dependant on ice conditions) from 3 to 6 pm. There will be a bonfire, hot drinks, and hotdogs and marshmallows to roast. Follow the trail in from the bulletin board on Dr. Kay Drive. As with all skating events in the Marsh, the event will be dependent on safe ice conditions. Check back here for ice updates in early February. For photos of this event, visit our facebook page. ﻿﻿Launched in 1998 by the Cornell Lab of Ornithology and National Audubon Society, the Great Backyard Bird Count was the first online citizen-science project to collect data on wild birds and to display results in near real-time. Since then, more than 100,000 people of all ages and walks of life have joined the four-day count each February to create an annual snapshot of the distribution and abundance of birds. We invite you to participate! Simply tally the numbers and kinds of birds you see for at least 15 minutes on one or more days of the count,February 12-15, 2016. You can count from any location, anywhere in the world! 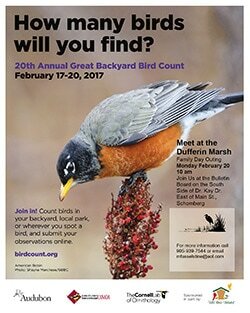 If you’re new to the count, first register online at www.gbbc.birdcount.org or join us for a guide bird hike - meet at the bulletin board at the Dufferin Marsh. ALE TO LAGER, BITTER TO RADLER... Hooray - it's beer! And for such a good cause. This tasting will feature a selection of craft beers from Ontario & Quebec presented by Garth Miller, brewer at Granite Brewery. Each beer is paired with delicious food provided by the Dufferin Marsh Nature Connection. TICKETS: $40.00 - Tickets are available at Grackle Coffee, from any member of the DMNC executive or call 905-939-7544. New and non-members are encouraged to attend! On Sunday November 8th, we're having what's officially known as our Annual General Meeting. Of course, this is really a chance to go for a hike and have a potluck party... The Hike will be on the Nature Conservancy Trail at Happy Valley Forest at 2:00 pm. From Schomberg go south on Weston Road to the 17th, turn right (west) then go to the first driveway on the left (south). There is an NCC sign there. 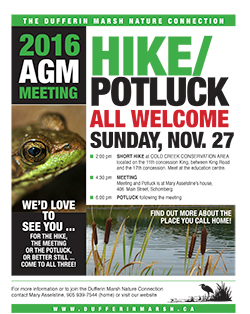 The meeting (4:30 pm) and potluck (6:00 pm - possibly earlier, as we do try to get the AGM over quickly!) will be at Mary Asselstine’s house, 406 Main Street, Schomberg. For more information, call contact Mary Asselstine at 905-939-7544. Special note regarding the potluck dinner... We'd like to focus on using ingredients that are locally sourced where ever possible. Please come out to any or all of these activities! The frogs are singing despite the cold weather. Join us on May 2 at 8 pm to learn about the frogs of the Marsh and learn to identify them by sound. 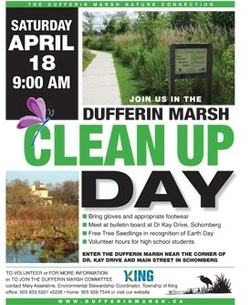 Meet at the shelter on the south side of Dr. Kay Dr.
Join members and friends of the Dufferin Marsh Committee as we cleanup the Marsh area along Dr. Kay and Cooper Drives. Vinyl gloves and plastic bags will be provided. We recommend you bring work gloves and wear rubber boots. If you're interested in coming out, we'll be holding a training and information session at the Grackle Coffee Company (on Main St Schomberg) on Thursday April 9th, at 7:00 pm. Birdwatchers from more than 100 countries are expected to participate in the 18th annual Great Backyard Bird Count (GBBC), February 13-16, 2015. Around the globe, tens of thousands of volunteers – of all ages and birding skill levels – will count birds in backyards, local parks, nature reserves, and wherever they happen to be. This free, family-friendly educational activity is loads of fun and supports bird conservation! 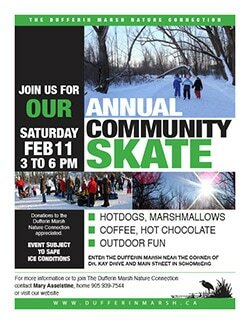 Join us for our eleventh Annual Community Skate and Bonfire at the Marsh. We'll have hot chocolate, coffee and marshmallows to keep our spirits up. Hotdogs and marshmallows will be available for roasting over the fire and warm drinks will be served. Our delicious coffee is provided by Grackle Coffee Company (208 Main Street, Schomberg). Dress warmly and bring your skates. We hope to see you there.